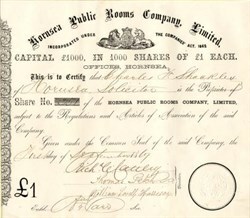 Beautiful engraved certificate from the Hornsea Public Rooms Company issued in 1869. This historic document has an ornate border with a vignette of a lion and a horse next to a crown. This item has the signatures of the Company's Officers and is over 137 years old. To provide attractions for visitors a Promenade Pier was erected by the Hornsea Pier Co., which was formed in 1865. It is an iron structure, and cost upwards of �10,000. Its length was originally 1,072 feet, but, during a storm in October, 1880, a small brig, called the "Earl of Derby," came into collision with it, and about 200 feet of the pier fell. A long course of litigation, now at an end, ensued, but the pier has not since been restored. Public Rooms were erected in 1869, containing a spacious concert hall, capable of seating 600 people.